The City of Sandy is proud of its stellar parks system. Facilities range from the 1.75-mile Tickle Creek Trail, to neighborhood playgrounds to the 127-acre Sandy River Park. The system is guided by a seven-person Park Board, which includes one advisory member from the Sandy City Council. It is a working board supporting planning efforts for and advocacy of the local park system as well as pitching in on park improvement projects. A departmental staff of two full-time employees and one seasonal employee maintain parks, open spaces and all City buildngs and grounds. 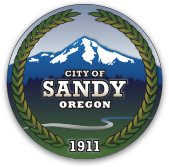 Please pick up a free City of Sandy Parks Brochure detailing our City's parks system at the Sandy Community/Senior Center (38348 Pioneer Boulevard) or Sandy City Hall (39250 Pioneer Boulevard ~ next door to Joe's Donuts). We are actively seeking City of Sandy residents who are interested in serving on the Parks Board. If you're interested, click here to apply!